Note: Whether you watch this video or not, at least have the beautiful strains of “Finlandia” playing in the background as you are going through the post. From St. Petersburg, Russia the day after, the next day gave us Helsinki, Finland. Because Helsinki is a relatively new city compared to other cities in the region (founded in 1550), I wasn’t sure what to expect. 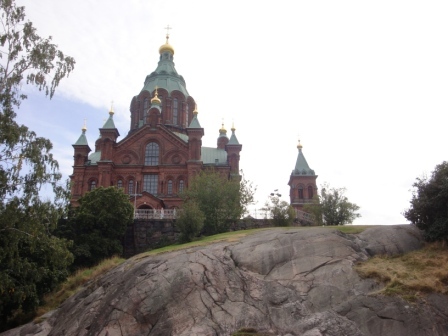 After all, I picture Europe as old, but Helsinki has no medieval past. Our port was in the city’s west docks, which is a long (but walkable) journey to the city center. If you ever get there, remember that a city bus route is available at this point. Helsinki is a modern, vibrant city with a variety of architecture – but its layout turned out to be quite a challenge. Nonetheless, the weather was great, so enjoy your tour. As we depart Helsinki, enjoy these two short videos about Finland’s main city. 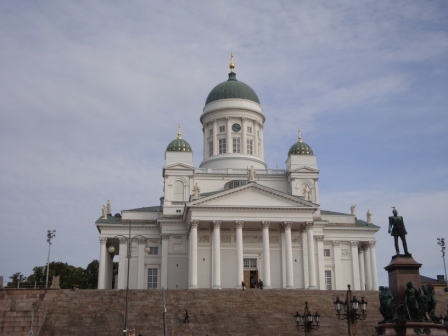 This entry was posted in Baltic Cruise, Travel and tagged Baltic Cruise, Celebrity Constellation, Celebrity Cruises, Church in the Rock, Cruising, Finland, Finlandia, Finnish Lutheran Cathedral, Helsinki, Helsinki Cathedrals, Helsinki Finland, Sibelius Monument, Travel, Travel Europe. Bookmark the permalink. Pity you couldn’t have gone further inland. Finland played a fair part in World War 2, actually defeating the better-equipped Soviet army in 1939, primarily through the use of ski troops. Taught the Russians quite a bit on how to fight during winter – not soon enough to defeat the Finns, but in plenty of time to take on the Germans 2 years later. Besides Molotov cocktails, they took out Russian tanks with a hand-held 20mm cannon. You think a 12-guage kicks? They HAD to fire the dang thing lying prone, otherwise it not only blew you off your feet, but tended to blow your shoulder out of its’ socket as well! First of all, with your WW II passion, I can’t believe you didn’t comment on the car! … and I put it in there for you!!! I didn’t know much about the Winter War. But it seems that the Finns gave the Soviets more resistance than they anticipated. However, it seems the conflict ended with a treaty where Finland gave up some valuable land. Therefore, and as a whole, did they defeat the Soviets or did the war end in an agreement? Indeed, Sweden will be the next stop, which hopefully will be next week. Meanwhile, here’s an British newsreel about the Winter War. Thanks for sharing. I’ll admit my statement about the Finns was a technicality – they negotiated a (harsh for them) armistice with the Soviet Union, but it avoided a looming catastrophic loss to the Soviets. But considering how badly the Soviets outnumbered the Finnish forces, and the Finnish lack of anti-tank weaponry and armour, they did a good job of holding the Russians off for as long as they did. And their ski tactics were adopted by Russian units during winter battles with the German Army during the various winter campaigns later in the war. I would love to hear first-hand accounts from the Finnish side – finding information about the campaign is hard enough, much less witnesses’ accounts! No problem on the car. I figure your WW II info just carried you away. 😉 Meanwhile, giving up valuable land is never a good thing. Then again, considering the potential consequences, the trade off was probably noteworthy. Hope you appreciated the newsreel! Thanks for the scoop. The music is so stunningly lovely, it makes me want to weep–and I don’t understand a single word. Wow! Thank you, Frank. Thanks so much, my friend. Glad you like this as Finlandia is a beautiful song. The words are all about country, so here you go, but this time in English. Thanks for visiting. Wow! Thanks, Frank. And Happy Thanksgiving to you! Happy Thanksgiving Kathy … and glad you like it! How beautiful – music and images. Esplanades are always so welcoming – and such intriguing buildings. Glad you enjoyed the music to accompany the images. 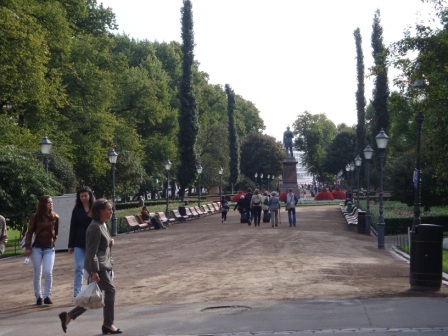 The Esplanade was several blocks long, and a wonderful oasis within a vibrant city. Thanks for visiting. My grandfather was Finnish. He came from a part of Finland that was taken by the Russians in the Winter War, but he had left before that. John Erickson must have been referring to a battle won by the Finns, because Russia defeated Finland in the Winter War, but the Finns held them off for 100 days. At the time Finland had a population of 2.5 million and Russia 25 million. Helsinki is a beautiful city, full of distinctive Art Nouveau architecture with a Nordic twist. The street names can be a bit difficult until you get used to the language. I write a blog called Beautiful Helsinki….which very few people read, but I love the city, so I keep doing it. I have learned more about the Winter War in the past 15 minutes than I ever knew, so I’m not going to get into any of the particulars. It seems the Finns held their own against the powerful Soviets. However, it ended with an agreed upon treaty, but the Finns gave up some valuable land in the process. Sure would be interesting to get the perspective from those on that land. Thanks for sharing your love for the city – and again …. I invite others to visit your blog to learn more about the city. 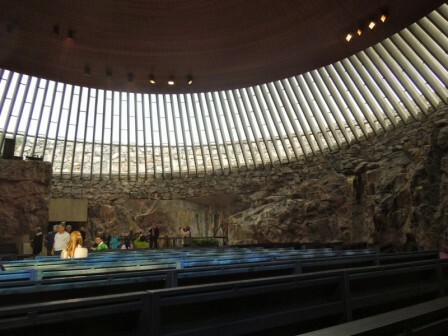 Given the Fins love and reverence for nature, the Church carved into the rock does not surprise me at all. Nor is it surprising given the importance they place on family and friendship that they took to communication -as I understand they have more cellphones per capita then most countries (at least they did at one time) -not sure how many realize where Nokia phones originate. My sister-law is Finnish, so I’m bias. They are a warm and intelligent people -they enjoy the simple pleasures in life, nothing wrong with that is there.. Finland is on my bucket list to visit in winter someday. Given your photos, it seems you enjoyed your brief visit. Every once an awhile I will visit web cams within Finland; they have a terrific network of traffic cams which really give Fins on the move up to date weather conditions. The ones in Lapland and the ski areas are quite interesting. Wow … you have shared a lot here. Very personal look, but without every being there … so your desire to visit is well noted. Great point about Nokia! FYI: It seems Finnish is one of the more difficult languages to learn in the world. Meanwhile, webcams throughout the world are a great way to peek at life elsewhere and learn! Great suggestion. Thanks for sharing your perspective! Another terrific travel incentive. Love the monument to the Finnish composer. Getting travel ideas is one reason for the post. We enjoyed the monument as well … but there wasn’t music! Thanks for commenting. “Hauntingly beautiful” is a great description. The city had much great architecture throughout it, which the videos show better. Glad you enjoy this, and thanks for visiting. I love this moving music as well. That tune was in my head last night and this morning! Thanks for commenting. I’ve been to Helsinki more than 30 years ago. The pictures are great! I didn’t realize that you’re on Constellation. We went on our first cruise ever this year to Norway and our boat was Constellation. Is Perry Grant still there? Glad I was able to rekindle your memory – and yes – Perry Grant was on the Constellation during our trip – and he is quite the character! How did you like cruising Norway? Thanks for stopping by. Norway and the Fjords were spectacular. Your cruise seem fabulous. I am so envious of the fabulous trips and beautiful places you’ve seen. At least you are sharing the glory with me, and other stay-at-homes. I enjoy sharing the trip. For are reminded of their past journeys – others are stimulated to visit – and some enjoy the trip they can’t take. So the pleasure is mine! … FYI: Two more stops to go. Thanks for commenting. Because airfare won’t be involved, check out cruising the Baltic as a vacation out of Southhampton or Harwich. On the plus side, you will visit the great cities. On the downside, you only get a snippet. Thanks for visiting. One day I want to travel to this beautiful Northern country, Finland. Do you know dear Frank, at first time I met Finland with a book,(I was a young lady 🙂 when I read the book) “The Land of White Lilies”… I am not sure it was translated in English, even in Russian too! Because the book was originally written in Russian by a Russian priest and parliament member Grigory Petrov, the notes at various intervals in which the author travels of Finland works, the last period of the mid-1800s the situation of the people of Finland, a handful of intellectuals in this country to get rid of ignorance tells the extraordinary struggle. The book, published for the first time in Sarajevo in 1923, translated into many languages ​​as soon as possible, especially the Kingdom of Yugoslavia, Bulgaria, and Turkey, has been the author of the highly acclaimed work of . The book gives a very romantic and exotic image of the rural Finland, written by someone who lived in a big city of St.Petersburg… I don’t know are there still a plenty of white lilies around, although we are trying our best to bury them under concrete in our effort to become more “civilized” …. The book obviously moved and left a lasting impression on you. My one short day there didn’t involve any rural areas, which I imagine is beautiful. Thanks so much for sharing your story!!! The music, ah the music. Thank you for posting the second in English. 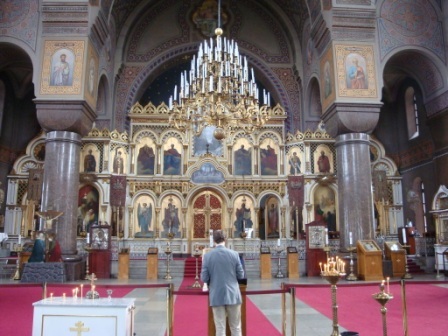 The churches are wonderful, I have always loved churches. Thank you for taking us along on this fabulous journey of yours. Although it is in Finnish, I selected the opening video because of the images and time – so I’m glad Kathy made the comment because I knew it existed. Meanwhile, Helsinki as a wonderful stop. Thanks for visiting. Wow! What a great Finlandic tour Frank!!!! You are very welcome … and thanks for coming along! Brr! That water looks icy cold! Not something I would do. But I would visit the churches. Breathtaking interiors. We had a beautiful, comfortable day there … but those who want to avoid cold weather, I doubt they would go for a winter visit. But summer is fine! Thanks for commenting. I know that the Finns love their outdoors! They also love to sauna, and will run from the sauna and then jump into the cold water. Sounds crazy to me, but hey – they know what is best for them! The water seemed like it would be cool, but I will admit that we didn’t touch it … but I wish we would have. However, research tells me that the average water temp when we were there is 14C (57F) … and that seems cold for my taste! Great point about your reference of old cities – which is relatively similar for us in the US. Glad you enjoyed my one day in Helsinki. Thanks for commenting. 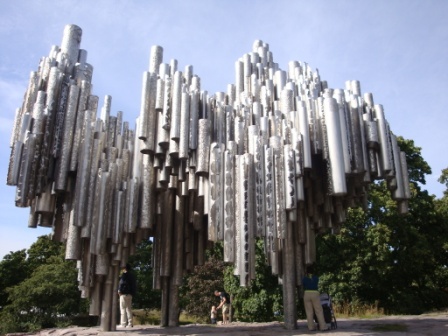 Thanks for sending Finland our way this Tuesday morning, and special thanks for including the photo of the stunning monument to Jean Sibelius (could you e-mail me that photo?) along with the very moving singing of Finlandia by the men’s choral group. Glad you appreciated this post …. and the email should be in your mailbox. Thanks for commenting. Jean Sibelius ”Finlandia” is one of my favorite pieces and I’m glad you chosen where they sings in Finish. A very powerful piece of music. Thanks you so much. Have only been i Helsinki one and I love the city – it’s called the “White City”. Will tell you a story about the Finish language – very different to all the other Nordic language and we have an opera singer in Sweden, that can sing on 8 different languages – and he was going to show himself of at a concert in Helsinki and decided to sing on Finish. Their language has very long words. So when the music finished – he had 2 sentences left to sign. 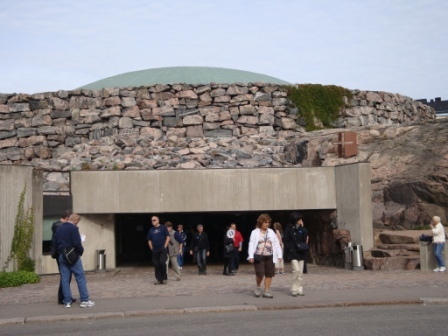 Frank, thanks for taking be back to the beautiful city of Helsinki – Helsingfors. Glad I was able create a smile with the Finnish version of Finlandia. Even without knowing the language, the power of the music comes through! Many thanks for your story of the Finnish language. I remember the long names on the street signs. Then when I heard about the difficulty of the language, plus its nonlink with the other Scandinavian languages, simply Oh my my. Love the story about the opera singer. I know the old Wilhelm church, but I will have to look into the new one. Thanks for the tip … and for sharing! An impressive set of pipes indeed. As a keyboardist, I thought it may get your attention. Glad you enjoyed Finlandia …. 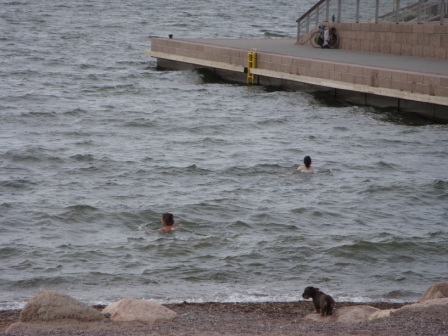 and the average temp of that water at the time of year we were there is 14-15 C. Brrrrr …. But warmer than it probably is right now! Thanks for commenting. The Rock Church was a treat … yet so different from the other two churches in this post. Meanwhile, wish I knew more about that car. Thanks for stopping by. Awesome Car! Looks like it could be nuclear powered. Glad you enjoyed the car. Walking by it I recall it was in very good shape. Thanks for visiting. I had no idea that Helsinki had no lengthy medieval history. Fascinating! Especially given it’s location, I’m with you on that one! Thanks for stopping by. Whew …activity was high there! … and that part of the world is worth the trip! Thanks for visiting. Well I liked the car. And the photos and music too. But the commentary on the newsreel always amuses me, those were the stiff shirt days! But tell me, why is the Finish bit of the cruise not at the end? Very good …. you ought to sneak that one in one of your lists! 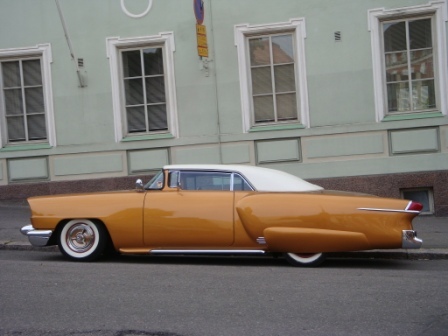 Meanwhile, wish I could tell you more about the car. Thanks for visiting. I’m very fond of Sibelius and love that monument! It is quite spectacular! I must admit that I know very little about Finland, so appreciate your videos. Helsinki is really a beautiful place, and I can see why you enjoyed your trip! I would love this country, I think. Every stop was full of treasures! Meanwhile, the chorus from Finlandia has been in my head since I posted this! 🙂 Thanks for commenting. Sibelius’s “Findlandia Hymn” is marvellous and adore listening to male acapella choirs. I listened to and enjoyed the first video, but got goosebumps listening to the English version. I have to admit that Finlandia was stuck in my head for about 2 weeks because of this post! Nonetheless, how can anyone not like that song! Interesting how we in the US have a different concept of old compared to Europe, Asia, and Africa. … and to think that Helsinki is relatively young compared to the neighborhood … then again, St Petersburg was early 1700s. Glad you enjoyed this and thanks for commenting. I never knew that Helsinki had no medieval history. But then my knowledge of world history is largely nonexistent. I enjoyed the photos and information. I didn’t know that either, but got it from travel guru Rick Steves (his tour book). Glad you enjoy this, and thanks for commenting. I had Finlandia stuck in my head for many days around this post! As for the monument, it was interesting, but it could have used some music. That organ was grand … and as I said, the rest of the church is strikingly sparse. 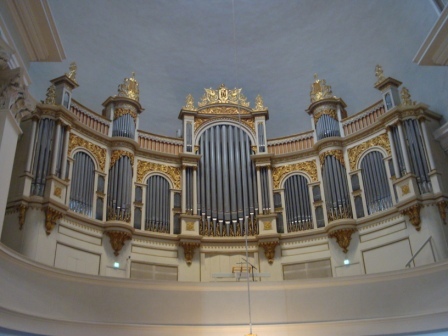 Now you have me wondering where we saw the pipe organ that was supported by two elephants. Beautiful! Thanks for stopping by to catch up! FYI: I linked the cruise ports to each other. You’ve captured the essence of the centre very well. On the subject of the Winter War and repatriations, it’s still very sore subject in many circles. What a generous offer as Helsinki is a beautiful city. …. wish I knew more about the Winter War to be able to ask an intelligent question. I wish I knew more too! Then I could point you in the right direction for additional reading. My education is quite lacking in this area. That’s ok … thanks for the thought.